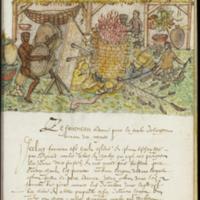 This small manuscript painting was created by Europeans and depicts the production of silver ingots in the Caribbean. 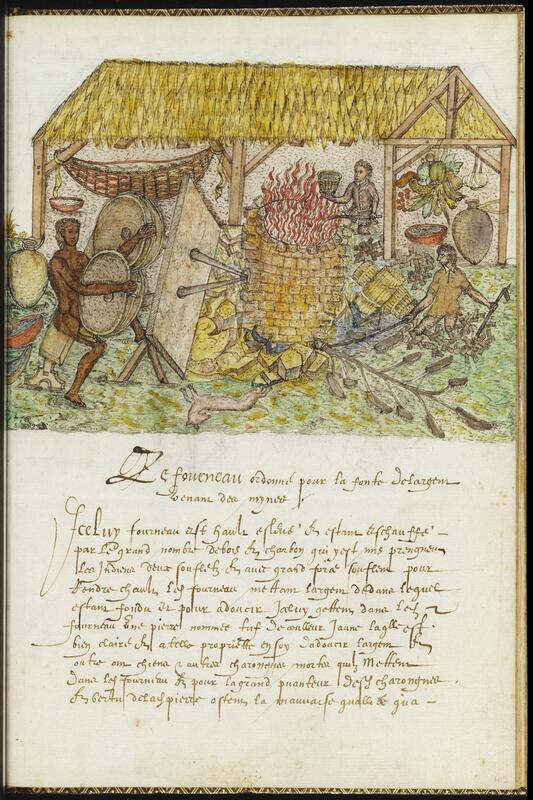 Dating from the late 16th century, with a French text, the manuscript describes not only the silver-making process but also the mining of other riches in Spanish America, including emeralds and gold. The thatched roof and hammock locate the scene in the Caribbean. Spaniards, identifiable by their full-body clothing and beards, as well as indigenous workers, were involved in producing silver ingots that would later be worked into coin. At the left of this image, an indigenous Caribbean man operates large bellows to stoke the fire to melt silver. Near his feet lies a dead dog, as it was thought (wrongly so) that dead dogs helped to purify the silver when burned. The scribes of the text below were not necessarily the same people who painted the images. The writing here is in late 16th-century French. A transcription and translation is in the Vistas library. At least two scribes and two painters worked on the Histoire naturelle des Indes. The names of none of them are known today. And while Francis Drake’s name appears in the manuscript, any actual historical relationship between the document and the famous sailor remains unclear. Painted in color on European paper, this is one of nearly 200 images of Caribbean plants, animals, and customs included in the Histoire naturelle. The imagery draws upon a fusion of sources—the text itself, along with impressions of either smelting or smithing from Europe—as the painters probably never witnessed first hand any silver mined or purified in Spanish America. It measures 29.5 x19.5 cm (11 ½ x 7 ½ inches). The original manuscript dates from the late 16th century, and although little is known about its history, it was held by a private collector until 1983. Today, it is in the collection of the Pierpont Morgan Library in New York. This relatively early representation, with its “ethnographic detail” focused on the Caribbean, may have been intended as a factual report. Yet, as with so many European representations of Spanish America, this one combines fact with imagined realities. While the smelting of silver—and the wealth it produced—was deeply fascinating to European pirates and sailors, royals and lay readers, few ever had enough information to describe the process correctly in detail. Images such as this one thus suggest to us, today, one way lore about Spanish American wealth was produced. Histoire naturelle des Indes: the Drake manuscript in the Pierpont Morgan Library. 1996. Verlyn Klinkenborg, et. al, eds. R. Kraemer, trans. New York: Norton. Lechtman, Heather and Ana María Soldi. 1981. La technología en el mundo andino = Runakunap kawsayninkupaq rurasqankunaqa. Mexico: Universidad Nacional Autónoma de México, Instituto de Investigaciones Antropológicas.